The statistics on incarceration in the United States are staggering. The U.S. Department of Justice reports more than 2 million people were held in Federal and state prisons or in local jails in 2003, and the number is rising at a rate of about 3.7 percent each year. With so many prisoners to manage and budgets often stretched thin, prison officials frequently complain they can barely maintain day-to-day operations much less institute rehabilitation programs. Admittedly the outlook is bleak. But what if something could be done to improve the future for even a few inmates? Something that gave them usable job skills and hope for a life outside prison. That’s what was going through Sister Pauline Quinn’s mind when she developed one of the country’s first prison dog programs in the early 1980s. Quinn, a Dominican nun, recognized the plight of an overworked prison system barely sustaining itself. Her idea: renew inmates’ belief in themselves and show them they could contribute positively to society. 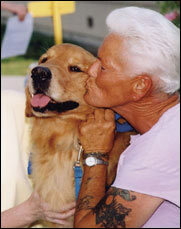 With the help of several professional dog trainers, Quinn launched the initial prison dog program at the Washington State Correctional Center for Women in 1981. From there her work spread through the years to other prisons around the nation and the world (she recently helped establish a prison dog program in Rome, Italy). The concept is simple. Programs that enlist dogs to aide people, from guide dogs for the blind to police canines, spend months and sometimes years training animals for service. Such programs require dedicated workers and volunteers with established training skills. But often trainers cannot spend all of their time with the dogs and the lack of consistent training can diminish the animals’ effectiveness. Enter the prisoner, who with nothing on his hands but time can keep a dog with him 24/7 and drill the necessary skills for as long as it takes. The inmates also benefit by learning valuable skills they’ll be able to use outside prison. There is no association of prison dog programs and no government agency keeps track of how many are operating. By some estimates there are hundreds around the country (the state of Ohio has programs in at least 29 prisons) in both women’s and men’s facilities. With so many programs, undoubtedly thousands of both dogs and inmates have made their way through their own prison dog journey. Most prison dog programs do not cost correction departments any money. Often they are maintained by individual non-profit organizations. Quinn says prisons are usually willing to help in some ways, perhaps providing fenced yards for the dogs to run or establishing a separate area in the prison for the inmates and dogs in the program. At Puppies Behind Bars in New York, dogs specially bred for guide service are placed in six prisons in Connecticut, New Jersey and New York. The puppies spend 18 months beginning at eight weeks of age with an inmate. Inmates in the program live separate from the prison’s general population with their dogs, but they must maintain a regular prison job along with their work as a trainer. The constant contact between dog and trainer and the inmates’ dedication means the program often turns out exceptionally well-trained dogs, says Annie Teillon, director of development for the Manhattan-based non-profit. Once dogs finish their training with inmates, they are turned over to either a guide dog school or law enforcement officials for bomb sniffing programs. Now in its eighth year, Puppies Behind Bars has graduated 34 working dogs (23 are guide dogs and 11 work as explosive detection dogs in the United States and abroad). From the streets New York, prison dog programs have made their way into small town America. Last year, the Kyle Correctional Unit in Kyle, Texas partnered with nearby animal shelter, Public for Animal Welfare Society, Inc. or PAWS. PAWS dog trainer Courtney Fish says the prison’s warden asked shelter officials about developing a program that would teach inmates some usable job skills. The inmate participants at Kyle are all about to be released, many after serving years on drug or related charges, and are in their final six months of rehab. Each week, Fish goes to the prison and teaches the inmates the basics of dog training. After two weeks of education, each inmate gets a dog he keeps for seven weeks during which time he trains obedience and even a few tricks. The end results are dogs more likely to be adopted. Fish says all of a recent group of dogs that went through training at the prison have found homes. Both PAWS and the prison are touting the program’s success, and already there’s talk of adding more dogs and inmates to the roster and maybe even bringing in an agility training course, Fish says.